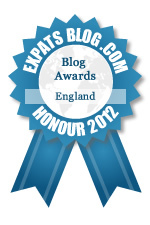 A blog about an American Expat in London, England married to a Brit and exploring Europe. This blog definitely needs the award! I get so excited when I see there is a new post to this blog. Her blog is so well written and the photos are just gorgeous. You can see in every word how much she loves England and her life in London. Her travels abroad are so much fun to follow. Following her blog guarantees reading wonderful stories, seeing beautiful photos and at times laughing until you have tears in your eyes. Definitely my favorite blogger. Selena's blog deserves much recognition! When you see her photos you want to melt into them, its like you're there on her journey with her!She doesn't just stick to one topic, her life is full & her interests are very diverse, from getting a drivers license in England to Shakespeare! She's intelligent and funny and takes time to educate herself on her many topics. What an entertaining blog! It has everything from informational posts about how the bathrooms are different to rants about appliances to heartfelt insights about what she misses most. There are quirky stories about her mishaps and inspiring stories about her successes. The photos themselves tell so much of the story and in such a beautiful way, but it's her unique writing style that draws me in and keeps me coming back. I laugh, I cry, but always I feel like I'm on this journey with her. Selena has done an amazing job keeping this blog real - her photography and writing are excellent, and the reader gets a true glimpse into her journey to acclimate in a new country. Well done! This blog is amazing! When you read it you feel like you are right there with her going through her adventures. The writing style is entertaining and comes from the heart. The photography is beautiful. I may never get to visit London...but thanks to this blog I almost feel like I have! I love Selena's blog written from the view of a Texpat. Her photography is great, and her perspective is fresh. This blog definitely deserves an award! I stumbled upon it quite some time ago and I can't tell you what a difference it has made in my personal journey of becoming an expat and moving to the UK. Her pictures are gorgeous and I love her writing style. Like others have said I have laughed out loud, cried, and dreamed of going to the places she visits. I have followed along and gained strength from watching how she has handled moving from another country. I have loved visiting and exploring all the wonderful places she visits and it has inspired me and encouraged me to get out and explore as well. Selena is so deserving of the recognition and I look forward to her continued success. Excellent interesting blog with lots of wonderful photos. I love reading Selena's blogs. Have shed tears of sadness and tears of joy at reading them. And the pictures are breathtaking to say the least. She has a beautiful way with words and a great eye for taking great pictures. She definitely deserves an award! I love reading Selena's blog she always shows me all that the world has to offer. Her clever comments always have me laughing.